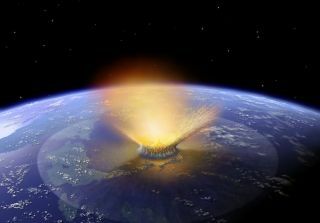 Artist's illustration of a big asteroid hitting Earth. CAPE CANAVERAL, Fla. — A NASA spacecraft is about to launch toward an asteroid whose cousins may have sparked the rise of life on Earth long ago. The OSIRIS-REx probe is scheduled to lift off from Cape Canaveral Air Force Station here at 7:05 p.m. EDT (2305 GMT) Thursday (Sept. 8), kicking off a two-year journey to a 1,640-foot-wide (500 meters) asteroid named Bennu. Scientists think Bennu and other asteroids like it harbor a lot of this stuff — molecules such as adenine and guanine, two of the four nucleobases found in DNA. Indeed, it's quite possible that Earth got most of its supply of such complex compounds via asteroid strikes long ago, NASA Chief Scientist Ellen Stofan said during a panel discussion Wednesday (Sept. 7) here at NASA's Kennedy Space Center. It appears that asteroids also delivered most of the planet's water, she added. After all, Earth formed from very dry materials. During the solar system's early days, volatile molecules such as water could condense into ice (and thereafter be incorporated into planetary building blocks) only in the cold region beyond the "snow line," which lies near the orbit of Jupiter, said fellow panelist Michelle Thaller. Where did all the Earth-impacting asteroids come from? Astronomers think Jupiter formed farther out than it currently lies, then migrated inward, perhaps nearly as far as the orbit of Mars, said Thaller, an astrophysicist and deputy director of science communications for NASA's Science Mission Directorate. This movement likely stirred the asteroid belt into chaos about 4 billion years ago, she said. "We believe that almost all the material that was originally in the asteroid belt has either been thrown into the inner solar system or thrown out of our solar system entirely," Thaller said. Some of the countless bodies flung inward undoubtedly hit Earth — thankfully for humanity and all other life-forms that have ever existed on the planet — the idea goes. "Throwing in these asteroids, throwing in these comets, possibly under the influence of Jupiter, actually made for the arrival of all of the water, all of the organics, that we use today," Thaller said. Similar things may have happened in other solar systems, she added. "We're trying to piece together the equation of where it would be likely to find life," Thaller said, referring to NASA's exoplanet-research program. "And perhaps one of the things that's in the positive column — you know, good place where life might exist — is a place with asteroids." Astronomers already know of extrasolar asteroid belts; for example, one exists around the star Epsilon Eridani, which lies about 10 light-years from Earth, Thaller said. Interestingly, Epsilon Eridani also harbors another zone of objects much farther out, which may be akin to the Kuiper Belt located beyond Neptune's orbit in Earth's solar system. This basic idea — that asteroids delivered life's building blocks — will get something of a test with OSIRIS-REx, Stofan said. "The information we're going to gain from OSIRIS-REx — it's really going to help pull back the curtains on the origin of this planet, on the origin of life itself," Stofan said.